Remove pork chops from the fridge 20 minutes prior to cook. Preheat oven to 350. Season pork chops with steak salt. 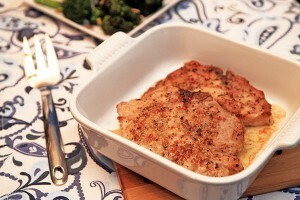 Dredge the pork chops in the flour; pat off excess. Heat olive oil and butter in large, cast-iron skillet on medium high. Place the chops into the skillet and sear on both sides until golden brown. Place skillet in the oven. Cook 8-10 minutes, until internal temp reaches 145. Remove from oven, allow the meat the rest 5-10 minutes prior to plating.